Tsavorite is a gemstone from the garnet family that was discovered in 1967 in Tanzania and again in Kenya in 1971, near the Tsavo East National Park. Tiffany & Co took interest in this light to deep, rich green gemstone, so much so that they proposed the name in honor of Tsavo East National Park, and started a marketing campaign arounds the stone in 1974! We most often see Tsavorites used in stone settings like a pavé of smaller sizes . 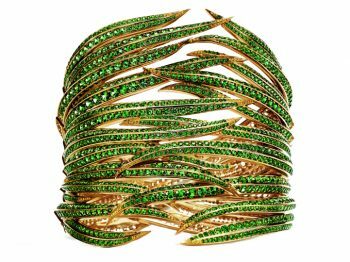 For example, in Tiffany’s 2017 Blue Book Collection, the Art of the Wild, we saw a gorgeous and textured cuff composed of tsavorite melee. 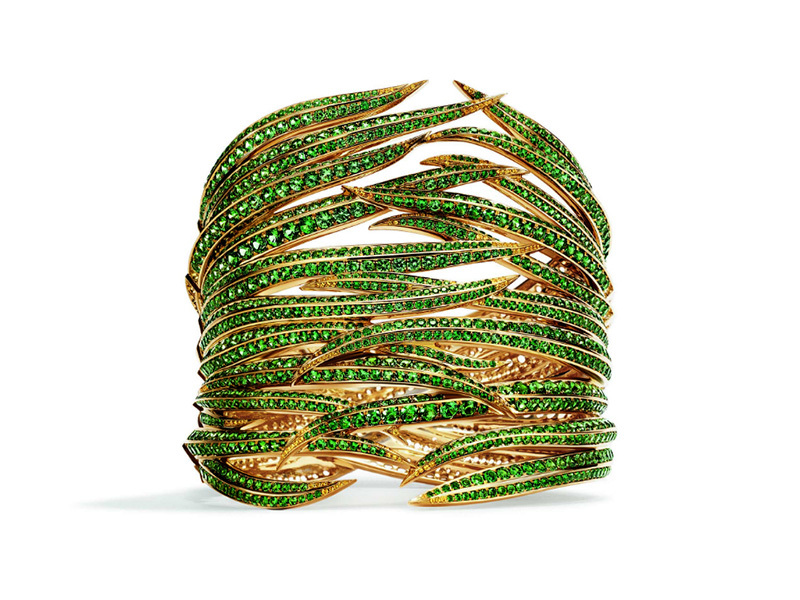 This yellow gold cuff emulates a natural, wild scene, one that could only be complete with the rich greens of tsavorite. The green color of the tsavorite is intense, the rendering is outstanding, it’s less fragile than emeralds and consequently less expensive. In 2017, Pantone’s color of the year was named Greenery. Tsavorite is the perfect choice for this, leading some jewelers to shift from melee to larger, center stone pieces of tsavorite. 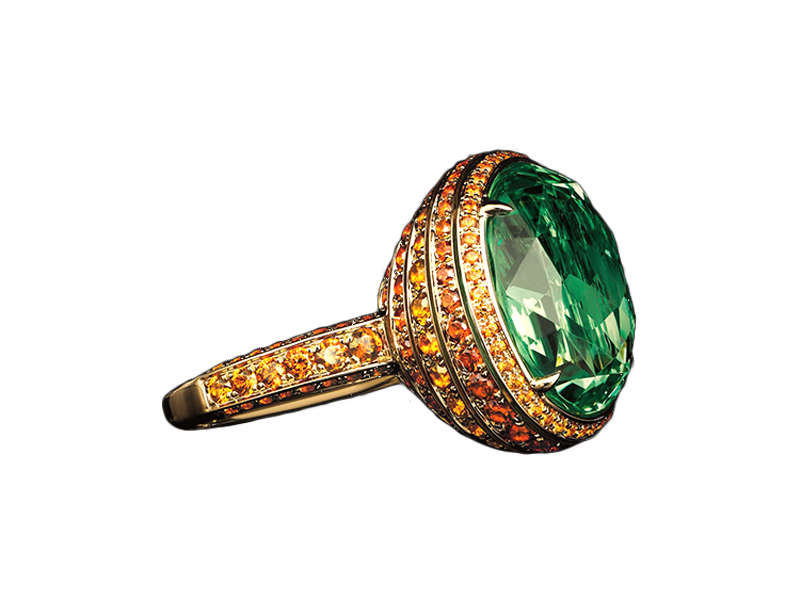 In the 2016 Blue Book Collection, Tiffany showcased an 11.79-carat oval tsavorite ring. This high, basket style ring was surrounded by rich orange and brownish orange spessartite garnet melee, helping to highlight the vibrant hues of the tsavorite. This year, we see Chanel using both center stone and melee tsavorite in their Coromandels High Jewelry collection. 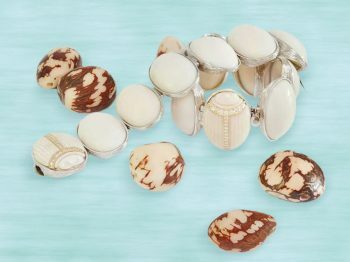 Chanel took inspiration from their beloved Coco Chanel and her love of Coromandel screens. These large folding screens are made of lacquer, with incredible designs on them. Chanel currently showcases Coco’s personal ones in one of their private salon’s in Paris! 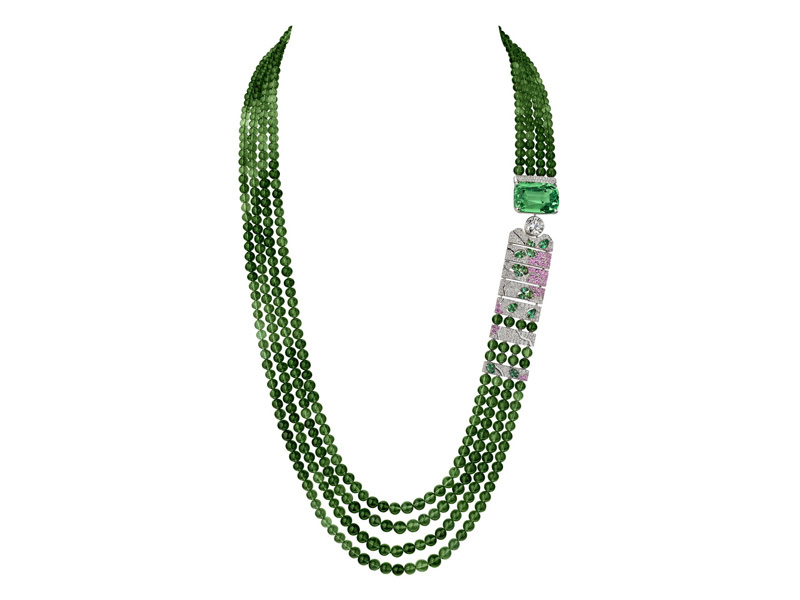 One necklace from the collection, Evocation Florale showcases a large 30.55-carat cushion cut tsavorite. This mint colored stone is crystal clear, providing an almost glassy effect. 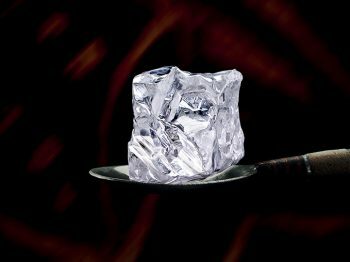 It is one of the largest components of this gorgeous, multi-faceted piece. Beaded green tourmalines make up the actual neck piece, with diamonds, pink sapphires and smaller pieces of mint tsavorite coming together to resemble a Coromandel screen. 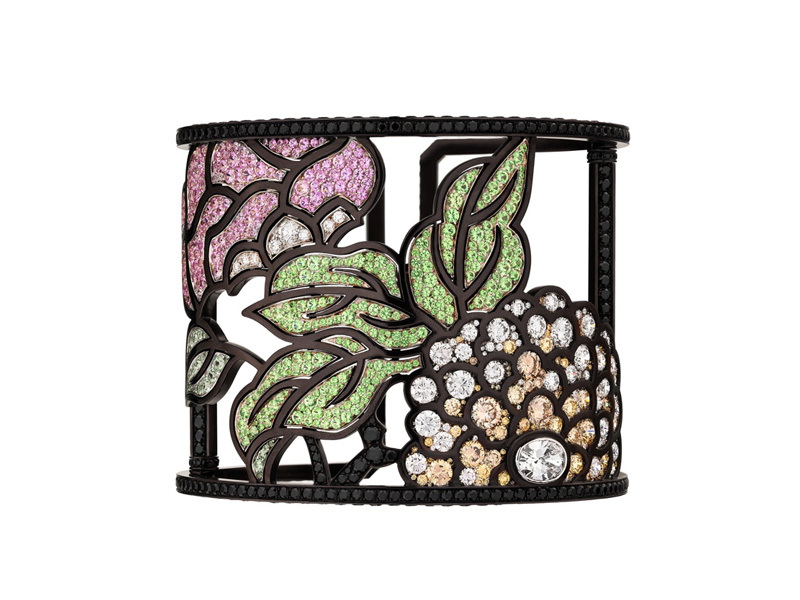 The Calligraphie Florale cuff showcases smaller melee pieces of tsavorite. This cuff makes use of negative space, creating not just a piece of jewelry, but a true piece of art. This floral ‘calligraphy’ scene would not be complete without the rich, natural colors of the tsavorite pieces. Tsavorite has proven to be a collection worthy piece, specifically with a recent donation from Beyoncé to the V&A Museum. 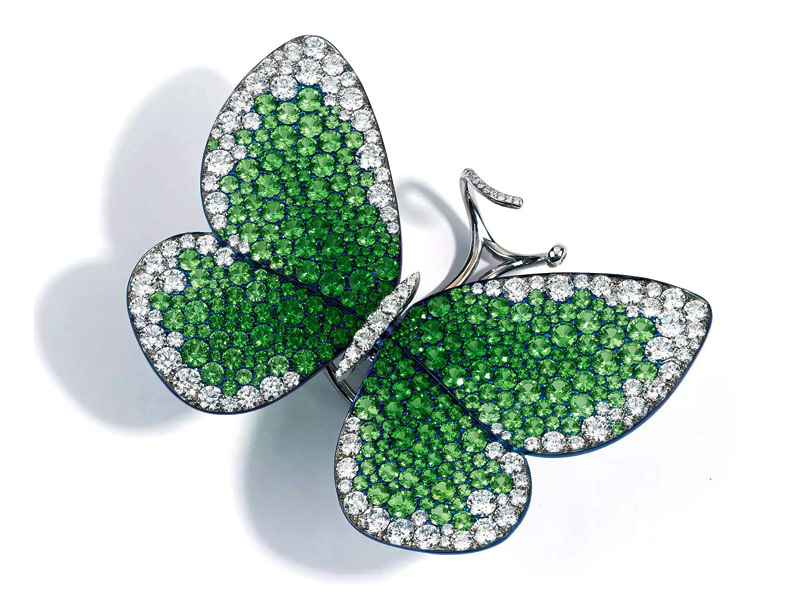 A gift from Jay-Z, this vibrant green tsavorite butterfly ring was designed by London based jeweler Glenn Spiro, who started working for Cartier at the age of 15! The piece is set with multi-colored stones, but the tsavorites setting remains the main component. Tsavorite’s rich and vibrant color makes it perfect for both center stones and stone settings and appears to be a great alternative to emeralds.